Long Range allows this creature to ignore all ranged attack damage penalties for distance. 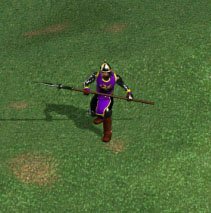 The crossbowman's powerful weapon does full damage at any range. 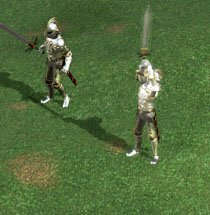 Comments: A good ranged attacker which is again, like its counterpart, betrayed by Hit Points, and especially its speed. The No Range penalty is a good asset in a siege. 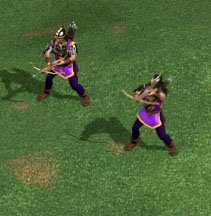 The Crossbowman also has commendable statistics for a level 1 creature. This creature's Stun ability gives it a chance of stunning enemies with it attacks in melee combat. Stunned enemies cannot take any action or retaliate for one turn. 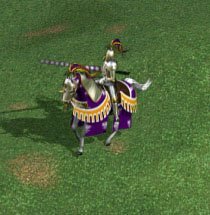 Squires use flails that have a chance of stunning an opponent for one turn. The chance of stunning depends on the damage done and the health of the target. No Obstacle Penalty allows this creature to do full damage to targets behind castle walls and other obstacles. 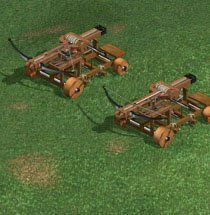 Ballistae are complicated mechanical units capable of firing a bolt over great distances. They can do full damage at any range, even behind obstacles and castle walls. Comments: A fair creature with an absolutely dismal speed rating of 0, and a combat movement rating of 2! This makes it poor for movement not only in combat but on the adventure map. No Range or Obstacle penalty makes this creature excellent in sieges, also due to the fact that it is mechanical already gives it an edge against strong spellcasting castles. Negate First Strike allows this creature to counter First Strike abilities or spells. 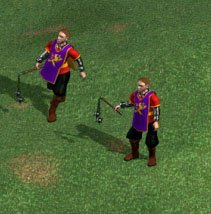 Pikemen are masters of the pike, which gives their attack a great reach than most of their opponents. They are also immune to the First Strike ability. Comments: A poor creature statistically with an fair amount of HP, but poor attack, defense, and damage ratings. Its cheapness and special abilities make it a meaningful addition to your army. Death Ward makes this creature 50% resistant to Death spells, and its Melee and Ranged Defense is increased by 50% against Death-aligned opponents. Crusaders are fervent warriors, experts with the sword who can attack twice a turn. 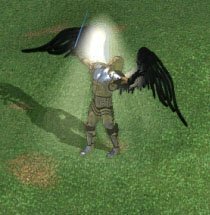 They are also resistant to Death Magic spells and take less damage from Death-aligned opponents. Has 50% magic resistance to Death Spells. Comments: A good level 3 creature with a slight lack of HP. The double attack special ability grants it extra leverage in combat. Additionally, it has high attack and defense and also a low cost, an excellent supplement to your army. 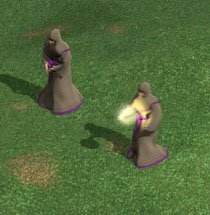 Monks are resistant to Death Magic spells and take less damage from Death-aligned opponents. Comments: A fair creature which has average HP and damage but good attack and defense ratings. However, the lack of specials make this creature very average, despite the good speed for a ranged attacker. Flying allows this creature to fly over obstacles, creatures, heroes and castle walls. Angels can resurrect friendly targets who have died in combat, but only those who were living before they were killed. Comments: An excellent creature with average HP, great attack and defense ratings, as well as great damage dealt. The low cost makes them available at an early stage, and they are swift and agile on the combat map and adventure map, a much needed boost of speed and movement considering the overall slowness of the Life town. The Resurrection special ability is also excellent, making it a clear choice on most occassions. First Strike allows this creature to strike an opponent in melee combat before it can retaliate. Champions can strike before their enemy can retaliate. And they do more damage when they charge over long distances to attack. Comments: On its own, the Worst level 4 creature, almost toppled in statistics by the Goblin Knight in 5 areas. However, its excellent growth rate and combination of specials make it formidable in numbers. However, even its cheap pricing and good specials do not stand up to the statistical and specialty superiority of the Angel. and to The_Hydra (Heroes 5 Content Admin, Heroes Community Moderator) for comments and HTML processing.